In a season where a lot of parity has occurred within the Big East, the No. 14 Villanova Wildcats and the No. 10 Marquette Golden Eagles have stood out amongst the pack at 10-0 and 8-2, respectively in conference play. Here are my five things to watch for in Saturday’s game at Fiserv Forum. In a season where little has gone wrong with a league-high 24.5 points per game, Markus Howard ran into a brick wall against St. John’s defense as the junior was held to 17 points, on 5-of-17 shooting in a 70-69 loss on Feb. 5. Don’t expect the off-night to be the norm as Howard will be in the national spotlight on Fox at 1:30 p.m. CT and tries to solve the puzzle of Villanova’s versatile defense. In the last meeting against the Wildcats in the Big East Tournament quarterfinal round on March 8, 2019, Howard finished with 23 points in a 93-70 loss as the Golden Eagles’ slim NCAA Tournament hopes were dashed. The Golden Eagles are in a prime spot compared to a season ago at this time in terms of their postseason outlook. Barring a late-season collapse of epic proportions, Marquette is bound for March Madness and a win against Villanova will boost an already impressive NCAA Tournament portfolio with wins over Wisconsin, Kansas State and Buffalo. The Wildcats have had the upper-hand on the Golden Eagles taking 12 of the last 13 meetings. A win against Villanova could turn the tide in the series for Marquette. 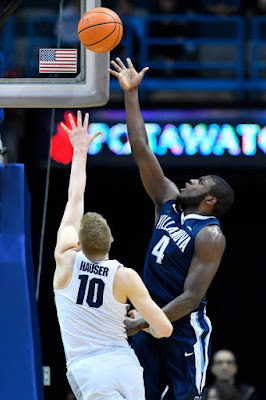 Saturday’s game celebrates National Marquette Day and the last time the conference foes met on the special occasion, Villanova got the best of Marquette, 89-79 on Feb. 27, 2016 as Kris Jenkins and Josh Hart finished with 19 points each in the win. After early season setbacks to teams such as Furman and Pennsylvania, Villanova has groove as it rides an 11-game winning streak behind the superb play of seniors Phil Booth and Eric Paschall. Booth has finished in double figures scoring in all but two games this season and is tied for fourth in the Big East with 18.3 points per game. Paschall comes into Saturday’s game seventh in the league with 17.3 PPG and has also produced double figures in each game except two. One of the bigger flaws in the previous four seasons of Steve Wojciechowski’s reign at Marquette has been a lack of effort on defense. The 2018-19 season has proven to be the total opposite as the Golden Eagles lead the Big East in field goal percentage (.405) and blocked shots (4.7). Theo John’s size and length up front has caused problems for opponents all season as the sophomore leads the Big East in blocks with 2.2 per game.